HEAVY COMMERCIAL ZONED LOT SHOVEL READY WITH ALL UTILITIES AT OR NEAR THE LOT LINE. STORM DRAIN RETENTION FACILITIES INSTALLED. 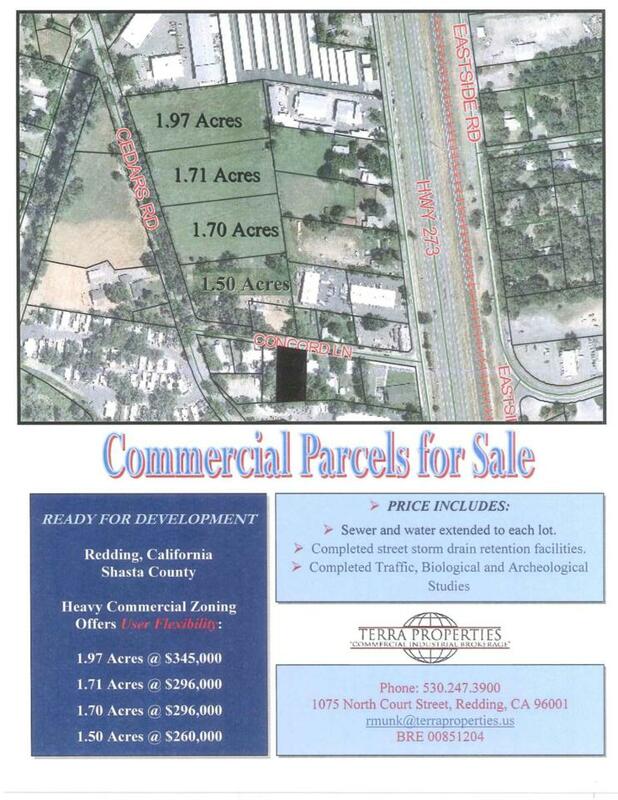 SELLERS WILL CONSIDER A BUILD TO SUIT FOR LEASE.THERE ARE 3 OTHER LOTS AT THIS LOCATION FOR SALE. CONVENIENT ACCESS TO I-5 VIA SOUTH BONNYVIEW RD.ONE OF OWNERS IS A LICENSED REALTOR. Additional Utilities Phone Available Terms All Cash To SellerCash To New Loan Bonds No Known Comm Land Type CommerIndust Development Status Finished Lot Distance To Trans 1 - 2 Miles Documents Available Aerial Present Use None Selling Terms CashNew Loan Sewer AvailableLotline Utilities Available AllUnderground Water Lotline Zoning Heavy Comm.